This is universal world music, not limited by borders, cultures, musical traditions or religions. It is unique, a masterpiece combining elements of pop, world fusion, and spiritual mantra. It was channeled from the Divine and despite the depth of the arrangements and original compositions, the entire CD was conceived, composed and completed through dedication, devotion and Divine grace in six intense and life changing weeks. This collaboration between Sri Guru Shakti Durga and producer/leading edge, transformative musician Vishaka Venkateswara, a kind of mystical Beethoven, will change how you think about spiritual music that will make you dance for joy. Begin your journey now. 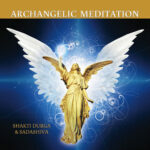 Enjoy this sacred journey and may it help you surrender to a new world of inner peace and bliss.